I have the fondest memories of Beef with Broccoli. You know, the Americanized Chinese classic that you can find in just about every mainstream Chinese restaurant in the United States. Back when I was a kid and all my siblings were older and way cool teenagers/young adults, I was the only person in my family who didn’t love eating at Chinese restaurants. Until I discovered Beef with Broccoli. And really, it was the gateway to harder stuff–Mongolian Beef. Moo Shu Pork. Hot and Sour Soup. 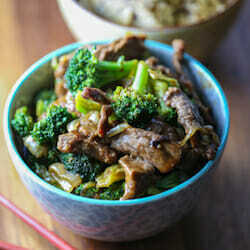 A whole new world of Friday night takeout was opened up to me with Beef with Broccoli. Even now that I’m an adult that likes to eat lots of different kinds of things, nine times out of ten, Beef with Broccoli is one of my choices when we get Chinese food. 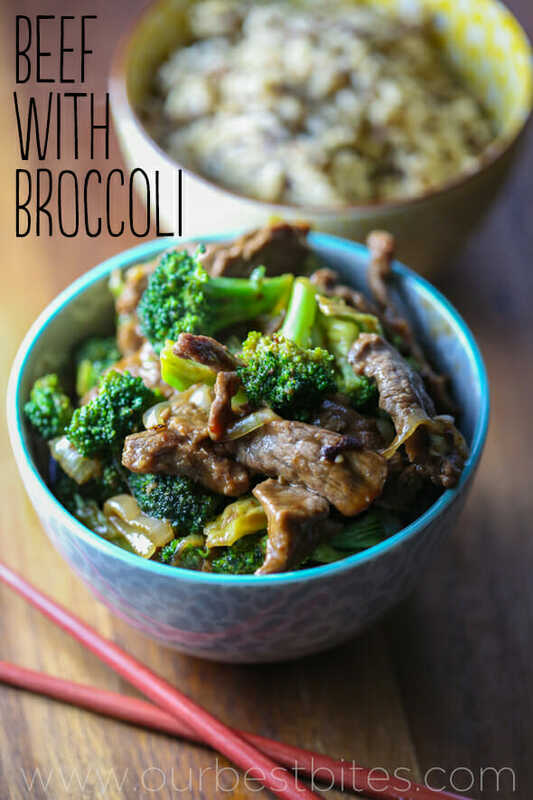 And this Beef with Broccoli recipe has been in my regular rotation since my oldest was a baby. It’s quick and easy–a true 30-minute meal–but it tastes every bit as good as something from a takeout container. To start, take 1 pound of flank steak (I’ve also used London Broil when I couldn’t find flank steak) and thinly slice it. Partially freezing it first will help you cut it into nice, thin slices. Season the meat with some freshly ground black pepper. 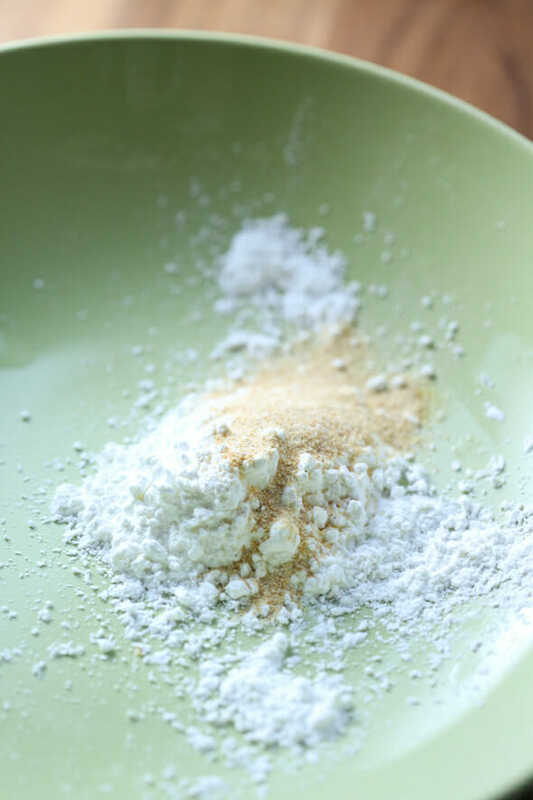 you’re going to need some water, cornstarch, and garlic powder. 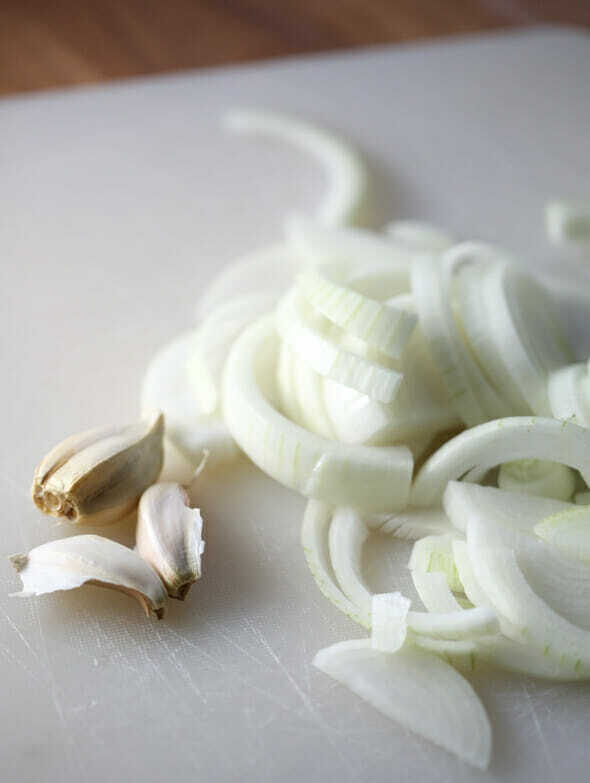 then whisk in a few tablespoons of water until smooth. Add the beef and toss until evenly coated. Set the meat aside and heat 1 tablespoon of oil in a large skillet over medium-high heat. 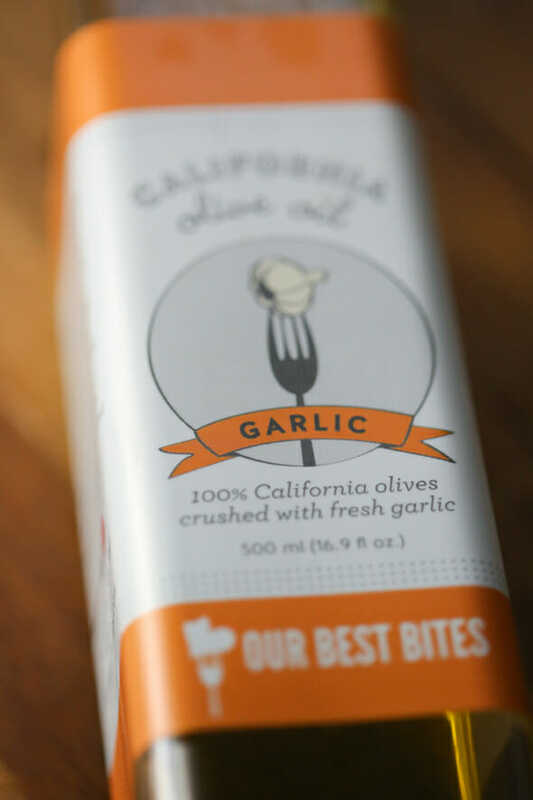 I’m using our garlic olive oil just to add a little extra punch of flavor. When hot, add the beef and cook for about 5 minutes, stirring occasionally, until cooked through. and broccoli (and carrots, if using). Stir-fry until the broccoli is tender-crisp, about 4-5 minutes. Return the beef to the pan and cook until heated through. 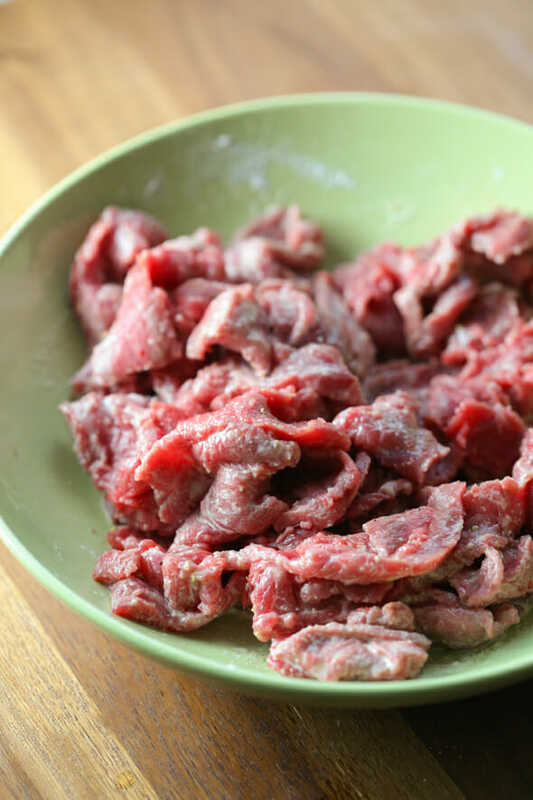 While the beef is re-heating, whisk together the remaining 1/2 cup water, 1 tablespoon corn starch, soy sauce, brown sugar, Sriracha, and ground ginger. Add the sauce to the beef mixture and cook for about 1 minute or until the sauce is thickened. Serve immediately over hot rice. Makes 4-6 servings. 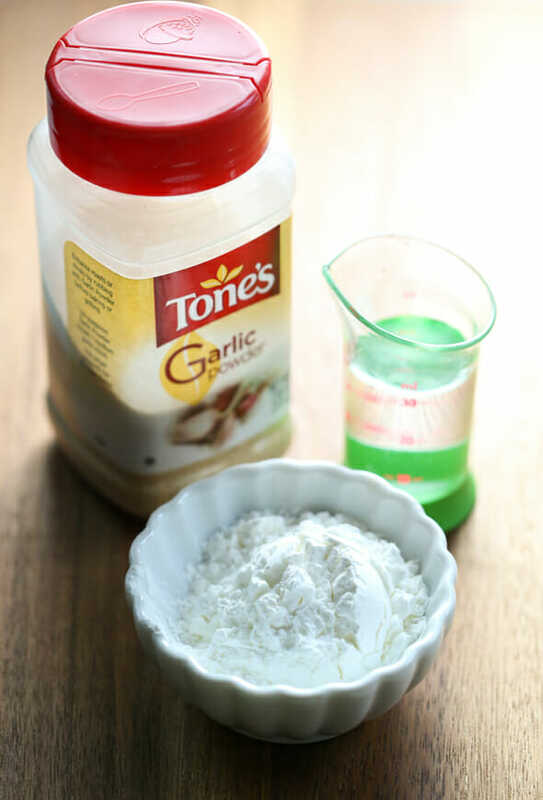 In a small mixing bowl, whisk together 2 tablespoons of cornstarch, 2 tablespoons of water, and the garlic powder. 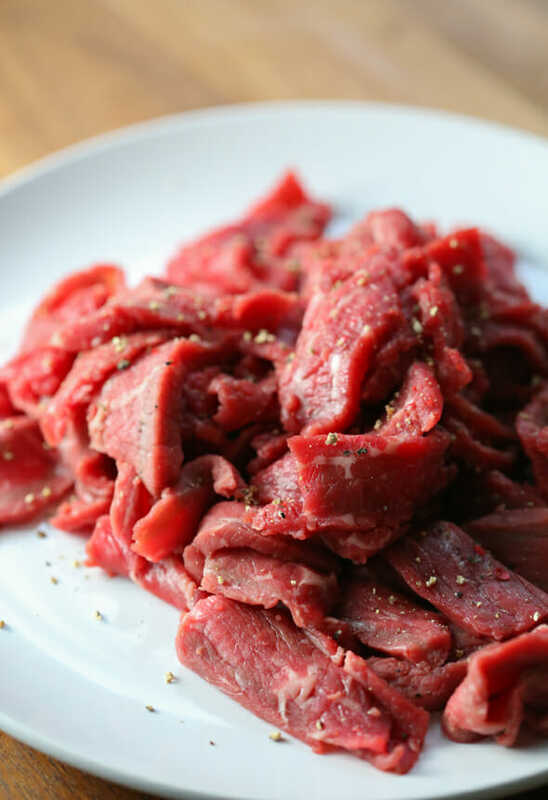 Sprinkle the sliced beef with freshly ground pepper. Add the sliced beef and toss to coat thoroughly. Heat 1 tablespoon of oil in a large skillet over medium-high heat. When hot, add the beef and cook for about 5 minutes, stirring occasionally, until cooked through. Transfer the meat to a separate dish and add the remaining tablespoon of oil to the pan. 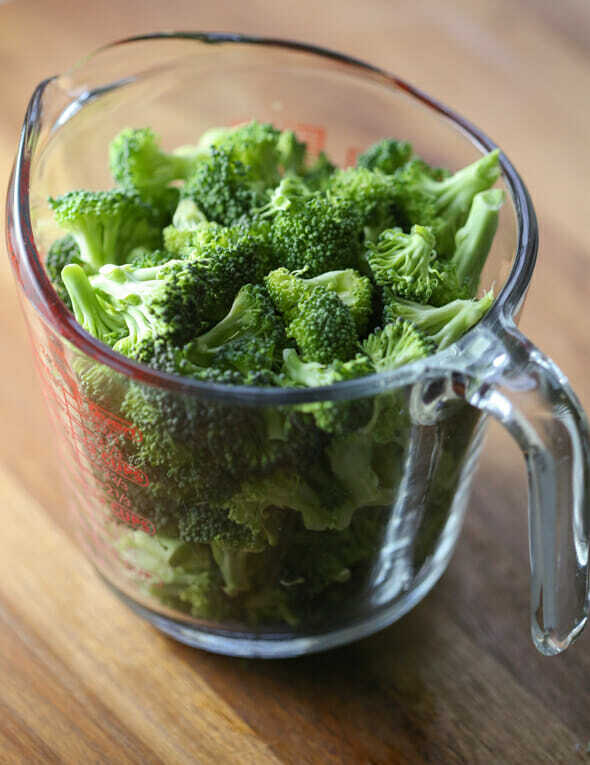 When hot, add the onions, ginger, garlic, and broccoli (and carrots, if using). Stir-fry until the broccoli is tender-crisp, about 4-5 minutes. Return the beef to the pan and cook until heated through. 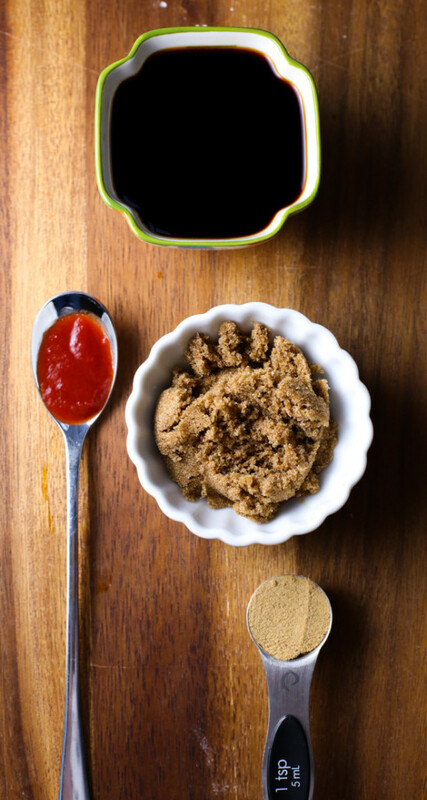 While the beef is re-heating, whisk together the remaining 1/2 cup water, 1 tablespoon corn starch, soy sauce, brown sugar, Sriracha, and ground ginger. Add the sauce to the beef mixture and cook for about 1 minute or until the sauce is thickened. Serve immediately over hot rice. Makes 4-6 servings. 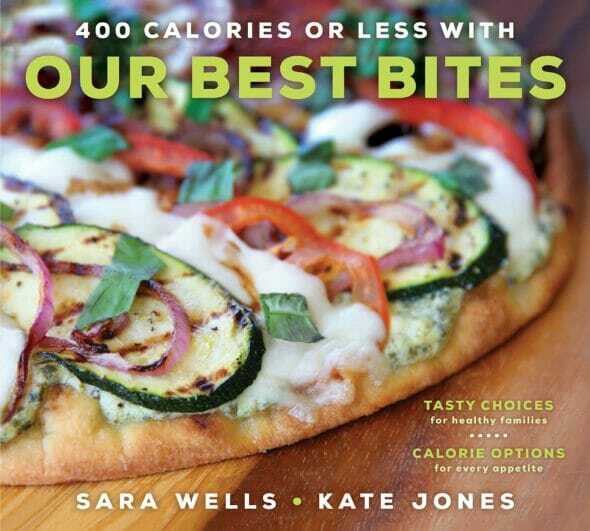 For more delicious, family-friendly, healthy recipes like this, check out our new book, 400 Calories or Less with Our Best Bites. You know take-out style Asian is one of my favorites- adding this to my menu plan this week, thank you Kate! I am a wimp when it comes to spicy foods. Does the sriracha make it really spicy or is it too small of an amount? Yum! This looks delish! I have a beef and broccoli stir-fry too. It’s actually pretty simple even for week nights and the boys love it. I have been making a similar stir fry for years, but I’ve never coated the meat with corn starch before. I’ll have to try it. That looks yummy! One of these days I’m going to do a big homemade Chinese feast with a bunch of your recipes – General Tso’s Chicken, Fortune Cookie and the rice from ‘Ohana. I’ll add this one to the list too! This looks awesome!! Can’t wait to try it! My 9-year-old daughter was just diagnosed with Celiac Disease last week and I’ve been scouring the internet trying to find yummy gluten free recipes that don’t require foreign ingredients. There are a lot of GF recipes out there, but whether they’re yummy or not, is another story. I know that any recipe you or Sara post and share here will be worth the effort and I will not hesitate to try them. Thank you for this! The timing was perfect! Wow did I screw *this* up! I must’ve overcooked the beef… It was like shoe-leather!!!! The sauce was good though, and the sriracha was definitely not “spicy”… Our toddler ate it (minus the beef) with no problem. Will have to try, try again!!! My girls LOVED the Orange Beef recipe! They call it “Meat Candy” and want it every week, so I will definitely have to try this. Although, my grocery store never stocks cuts of flank steak? Great recipe. I am confused about the cornstarch. I assume you add 2 Tablespoons in the beginning and 1 at the end??? This was soooooo yummy! And for the record, I don’t like Sriracha and you definitely can’t taste it – just makes the sauce super yummy! I just made this for dinner and it’s awesome. Thanks for helping me feel like a rock star! Not to be one of *those* people, but I made this tonight with some leftover pork loin that needed to go, and it was so good and easy! My 4 yo asked for, and then ATE seconds and requested that I make it “every night”. Definitely going in the rotation. Soy sauce isn’t generally gluten free, just FYI for those cooking for someone with Celiac or that really needs this to be gotten free. You can get gotten free soy sauce though. I was thinking the same thing. Soy sauce usually has wheat in it so it’s not gluten free. Tamari is what I have on hand for my GF granddaughter. I made this tonight and it was absolutely delicious! Thank you for a great recipe!